for more than a year now, i've been using the Modelco Brow kit for my eyebrows. then i bought the eyebrow palette from In2it when i started in makeup school and use it for my clients. but being a makeup junkie, i am always looking for something new to try. my modelco brow kit is soon to be finished, so i decided to try out PAC's eyebrow kit. "Strike up your way to the center stage with a fabulous eyebrow form that catch up the attention. A compressed eyebrow kit with application to reveal your true Diva star struck eye brow. Excellent color scheme providing you variable nuances and effect." what i love: it works like my Modelco brow kit, and it's cheaper! more than twice cheaper, actually. though it doesn't have the eyebrow stencils, a spoolie and the brow wax...i find it okay since i don't really use them anyway. 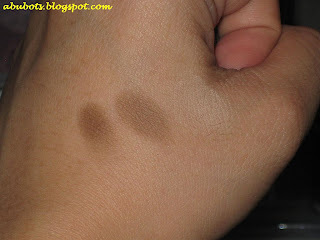 and with PAC, i have 3 colors...one dark and one medium shade of brown and a highlighter. 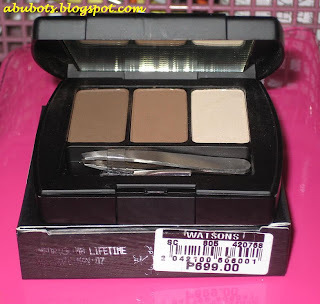 and aside from that, this palette (or brow kit) can also be used as an eyeshadow! so for those who love neutrals, this can work both as an eyebrow kit and an eyeshadow palette. such a good deal, right? 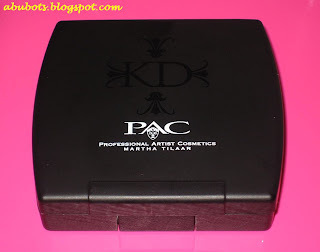 i also love the black packaging...and it's smaller (though bigger than my In2it) than my Modelco so it's easier for me to have it inside my small beauty kit. the colors are just like those of my Modelco's and it also stays put. what i hate: the brush! i find it too soft, unlike the brush in my Modelco brow kit that i still use until now. 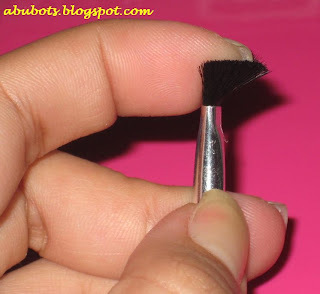 i think that for lining/drawing your brows, you need a more sturdy, firmer angled brow brush. and the brush in the PAC brow kit, isn't like that. 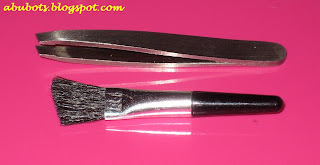 this is my brow brush from my Suesh 21-pc set. i use it with my PAC brow kit. i wish the kit comes with a smaller version of this brush. so i just threw the brush away together with the tweezer since i am not used to using tweezers like that. 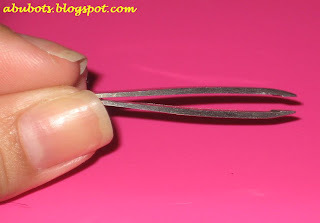 i am more comfortable using a pair of tweezers where i can put my fingers inside the loops of its handle. my brows drawn with the PAC brow kit and topped with MAC brow gel in Girl Boy (love, love this browgel by the way!) i didn't use the highlighter shade in this pic...but it's really nice to brush it under your arch for highlighting. i should've posted a pic of my brows using my Modelco brow kit as well, so i can show to you that PAC works just like my Modelco. IAMSUTIL gives this product 5 thumbs up! your eyebrows look really good!